Perfectly styled to energize today's urban-chic contemporary decor, this 6' x 9' rug from Safavieh's Vision Collection is a beautiful addition to any home. Its cream color enhances the sleek streamlined look and blends effortlessly with neutral color palettes. The rig is incredibly soft, thick and has a deep pile that has tones of cream, beige and white. Very pleased with how well-made it is. Goes well with any type of decor. It sets of my table well and defines my space. I bought two of these, an 8x10 and a 9x6, to tie together 2 seating areas in my great room. The color is beautiful and the texture is soft and lush. They both rolled out quite nicely, not holding on to creases or rolled edges from shipping. I have medium color wood floor and dark brown leather and dark wood furniture. The creamy color brightens the room and adds lovely contrast of light rug against the other darker colors. These were a great purchase! I rated this average because I didn't even open the roll when it arrived. Within one hour after I ordered it I tried to cancel the order since one review said the stripe is very apparent. I was told I couldn't cancel the order but could return the item via UPS and a delivery fee. I will not order from them again. Love this rug! Great quality and color in photos are pretty accurate but much better upon arrival. Cream and Taupe tones that go well with almost any decor. Easy to care for and soft to touch. Be sure to purchase accompanying rug pad to enrich softness/padding and keep in place. This is an awesome rug! It has a low pile height of 0.5 that is very soft and plush looking. I do use a rug pad to help keep it from moving around on the hardwood floor. I love the colors (cream/tan/beige) ..... perfect with the darker woods and leather furniture in my front room. I live this rug. I highly recommend. It has the colors I wanted and looks great in my living room. I have a chocolate colored sectional and this rug subtly picks up the colors and makes the room look larger because it is lighter. Very pleased with the size and color of this area rug. I received the rug after a few days. I wanted a soft rug that can stand up to high traffic. The rug is beautiful and I am very happy with the purchase. 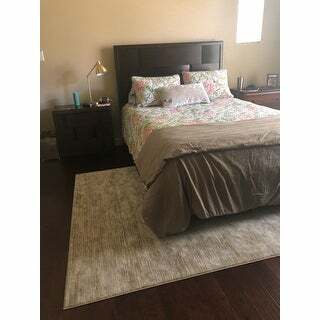 The rug is a cream color with beige and brown lines so don’t get it if you want a solid cream color. My kids love to lay on it. A great buy overall! It's okay. It's more striped looking than I thought from the picture. I kept it just because it's a pain to return. It's not horrible but not exactly what I wanted. Love this rug. Have it in 3 different sizes. We have it in the ivory with two dogs and a toddler and stains come up really easily from it. We love it. 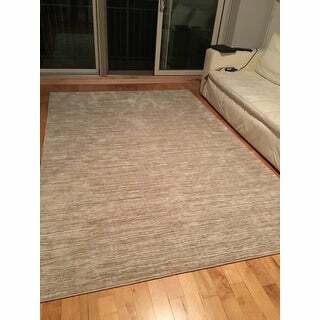 Very nice quality rug and is a perfect neutral for our space. We needed something that will add a little touch of home to our condo. perfect! We also purchased a protector for underneath and to prevent slipping. Gorgeous!! Looks very rich for the price. Super soft texture, doesn’t shed at all, doesn’t bunch up because the backing is thick and sturdy. We do have a pad under it but could probably be fine without it. Love it, my 4 kids practically live and play on this rug all day now. This is a great rug. It is very neutral and goes great under my kitchen table. I bought a bigger one for my family room by my sectional. I get a lot of compliments. It is thinner than I expected. Nice rug, very soft pile. So far no shedding (except for rascal cats). Great rug for the price. Very soft to walk on. Love the subtle colors. "Tonal? Is it cream/brown or grey?" "Can you please post the cleaning recommendations for this rug. I need something for pets that I can literally take outside and use a hose with if needed." We recommend using a slightly damp rag for spills and messes. For long term care, we recommend professional cleaning. Love the color to put on my dark hardwood floors in my den!